It's time to go on an adventure! 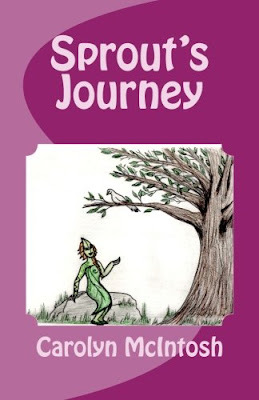 All you have to do is read this new book, Sprout's Journey, written and illustrated by my niece, Carolyn McIntosh. This is her debut book as an author and, inside, she shares the experiences of a girl by the name of Sprout. It is similar to Pilgrim's Progress in the way that Sprout meets many different friends and foes along her path. Some of them include: Complacency, Ego P. Ride, Shimmer of Hope, Humble Inspiration, and Good News. She encounters many obstacles along the way, as well as encouragement and hope, which are all meant to help her grow in her faith. Carolyn writes: "Sprout's Journey is about a girl who has been a Christian for awhile, but is just now choosing to follow the path The Creator has set before her. She is named Sprout because she is still in the process of growing." "First... you must trust The Creator one-hundred percent. Then, once you have committed to doing that, you must understand who you are in Him." "You see, young Sprout," the man continued as he pointed towards the horizon, "The world is full of lies. I can already see how they have burned your heart as the sun burns skin. It wasn't meant to be there and it causes great pain and suffering. That is why you must read The Book and learn the truth." Humble Inspiration turned, looked Sprout in the eye, and warned, "Do not believe the lies. You have to understand that The Creator is good." "Second," He continued, "you must believe with all your heart that The Creator has a plan and that He will not leave you. Even when the path becomes tough and you feel like quitting, you mustn't settle for less." You will also find various quotes and Scripture references to back up the content in the book, so it might even be good to use in a Sunday School or youth group setting. Order your copy today on Amazon. It is available in paperback or Kindle formats.